This is a sponsored conversation written by me on behalf of Tyson Foods, Inc. 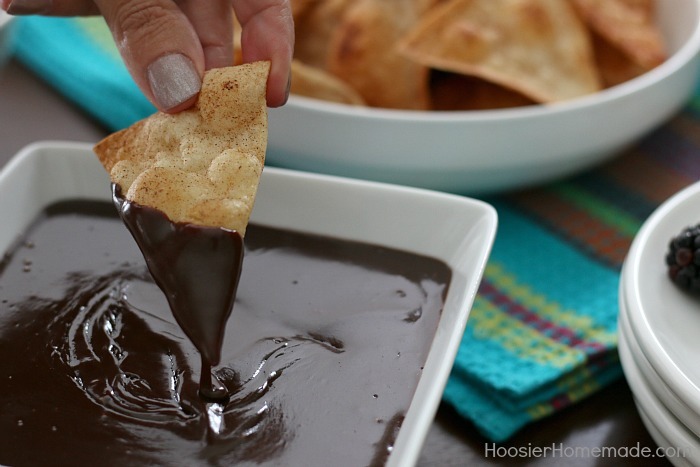 The opinions and text are my own..
Impress the football fans in your house with this simple and sweet Tortilla Chip Dessert Fondue! 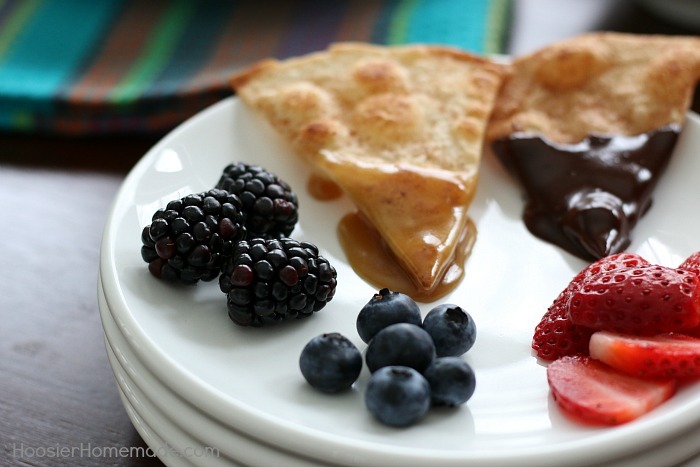 The cinnamon and sugar tortilla chips are easy to make and the homemade caramel and Mexican chocolate sends it over the top. Oh and we can’t forget the fruit for a little burst of freshness! I don’t know about you, but for me watching football is all about the food. Of course, my house full of men wouldn’t agree with me. With all the wings, dips and cheese floating around during the big game, it’s nice to have dessert too for the sweet lovers in the crowd. We decided to change things up with the chocolate fondue this time, it’s made with Mexican Chocolate. 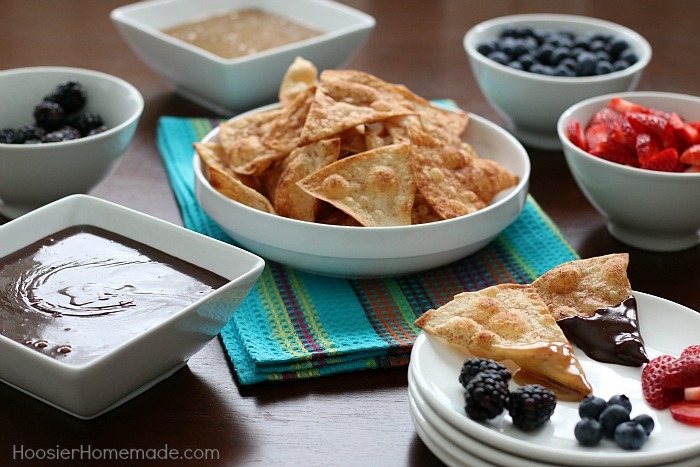 And the cinnamon and sugar baked tortilla chips go great with the chocolate. I’m a huge fan of the caramel and with the addition of the fruit, it was perfect. Keep in mind that you can add whatever toppings you’d like. However, I’d suggest keeping the chocolate we used, the Mexican chocolate paired perfectly with the chips. If you’ve never had Mexican chocolate, you are in for a great treat. When you buy Mexican chocolate at the store, you’ll notice it’s not traditional, instead it has sugar and cinnamon mixed in, which gives it such a unique and awesome flavor. Enough with the small chat, let’s dive into how we make this Tortilla Chip Dessert Fondue, so you can enjoy them around your home as well. This recipe was created using TortillaLand tortillas that I always get from Costco, they are located in the refrigerated section. They’re super easy to find. We use them because the ingredients are super simple; water, salt, sugar, canola oil and wheat flour. They come uncooked, but are so easy to cook and only takes about 60 seconds from start to finish. Since you will be grabbing a bag of TortillaLand tortillas, be sure to grab extra and make the Vegetable Roll Up Recipe to add to your football party. 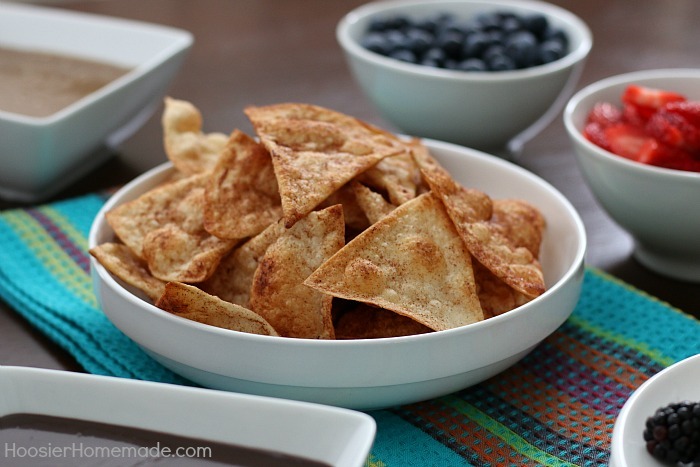 Watch how incredibly easy it is to put the cinnamon and sugar tortilla chips with TortillaLand tortillas. Now, I hope you’ll enjoy making your own fondue memories with your family and football fans. 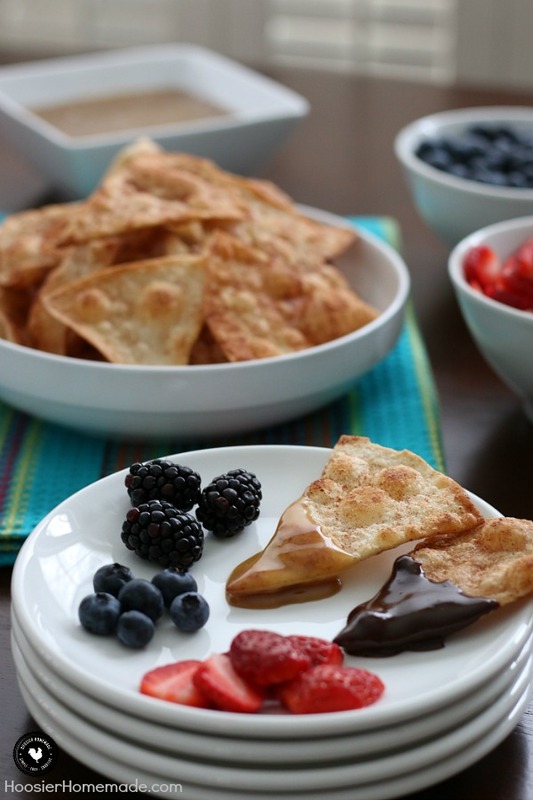 Easy Cinnamon and Sugar Tortilla Chips dipped in Mexican Chocolate or Homemade Caramel and fresh fruit on the side. This is a sponsored conversation written by me on behalf of TortillaLand. The opinions and text are all mine.